As much as I or anyone else will wax lyrical about how bread makers can change the way you shop or bake your bread, spending a lot of money on one sometimes seems like a bit of a risk just for something that makes bread. After all, you can go to the shop and get a loaf for under a £1, it would have to be pretty special to fork out a lot of money for one. Thankfully there are many budget bread makers around and this is one of the best ones in that category. 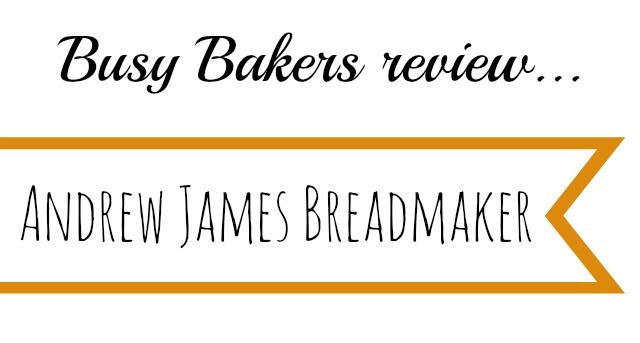 Here’s our Andrew James bread maker review – I hope it will help you decide whether it’s for you or not. 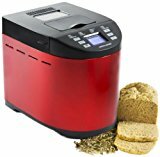 As I stated earlier, this is one of the best bread makers around that fit in to the budget category and although prices do change you should be able to get this one under £50. It’s a lovely looking machine in a nice brushed stainless steel finish which should look at home in any kitchen. It has a window so you can peek inside at your baking bread and an easy to use LCD display which allows you to set the right program and then see how long it has left to bake. The main question asked with bread makers is whether it makes a good loaf of bread and I think the answer to this one is yes, it does. Although I’ll be honest and say that it does take some tweaking as the recipes in the manual aren’t the best. So as you can see there’s a few different ones there to try. What I particularly like about this machine is the home made function which means you can program your own cycle. Jam and cake programmes mean that you can do so much more than just bake bread too. An essential feature for me is the timer. Quite often I’ll decide to bake bread but realise I won’t be around when it’s due to finish and so I’d be risking the bread being ruined. A timer can solve those problems and so I won’t get one without it anymore! The timer on this bread maker is for 13 hours so it’s perfect for putting on before you go to bed enabling you to wake up to fresh bread in the morning or setting before you go to work. There’s also a 60 minute keep warm function so if you sleep in or are a little later getting home it won’t ruin the bread. The Andrew James bread maker also comes in a nice red option which is slightly more expensive but might suit your kitchen a bit more! Click the picture for more details. As well as giving my own review of the product, one thing that I really like to do is check out the rest of the internet to get a more rounded view of what people have said about this bread maker. 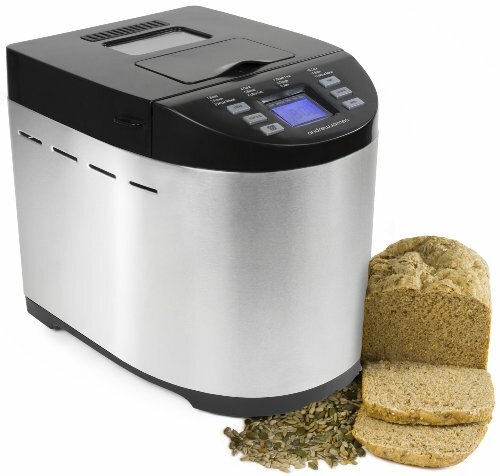 The bread maker is a really popular one and one of the top sellers on Amazon.co.uk. It’s received over 500 reviews and has an average rating of 4.2 out of 5 stars which I think is pretty good for such an inexpensive bread maker. I think that the price point of this one really lends itself well to people who have never used a bread maker before and aren’t sure whether they would be worth the money. The main positive points about this bread maker is that it produces really great bread. One of the things that stands out as a negative though is that the recipe book isn’t great so I think it really needs a bit of a commitment to tweaking the recipe to get it right. Overall this Andrew James bread maker is a great buy. If you’re on a budget then no amount of convincing will make you drop over £100 for a more expensive machine and this one is a fraction of that cost – a much better test for those who may be sceptical about whether it will be for them. And it makes great bread – what more do you need? Thanks for sharing this review! My mom has been wanting a bread maker for the longest time so this is so helpful!